While traveling through Thailand, my partner and I joked about buying a coconut plantation because it seems that everything nowadays is coconut based! Coconut (C. nucifera) belongs to the Arecaceae (Palmae) family and the subfamily Coccoidea. Baldness – combine coconut oil with lavender, rosemary, thyme, cedarwood, Jojoba oil, Grapeseed/ castor oil, and a little cayenne pepper. Apply three times a day (or before bed) to an affected area of hair loss and massage in. Coconut oil and these essential oils support cell regeneration. Eye cream – apply under the eyes to reduce puffiness, bags, and wrinkles. Use on the lids in the evening. Face Wash/ Soap – mix equal parts coconut oil with olive oil, almond oil, avocado oil, and castor oil and use in place of soap when washing your face. Wet face, rub oil in and leave on for two minutes, rinse and pat dry. One teaspoon should be adequate. Healing – when applied on scrapes and cuts, coconut oil forms a thin, chemical layer which protects the wound from outside dust, bacteria, and virus. 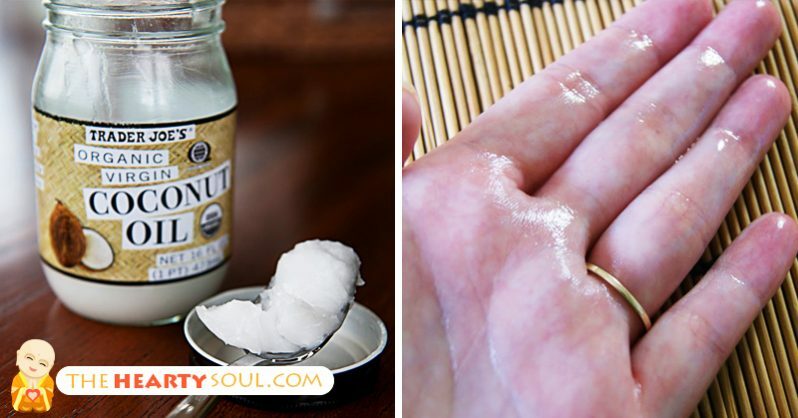 Coconut oil speeds up the healing process of bruises by repairing damaged tissues. Plus, it smells a heck-of-a-lot better than anything from the pharmacy. Acne Skin Fix – prone to oily skin or an oily T-zone? Use a pea-sized amount underneath makeup or alone to reduce oil gland stimulation. Often acne prone skin is actually too dry, which signals your glands to produce more oil and clogs the pores. Skin Conditions – coconut oil can relieve skin problems such as psoriasis, dermatitis, and eczema. Tattoo Healing and Moisturizer – continued use of coconut oil on tattoos will help keep the pigment from fading. Used on new tattoos, the coconut will hasten the healing process and decrease the chance of infection. Wrinkle Prevention and Wrinkle Reducer – rubbing coconut oil on wrinkles and sagging skin helps strengthen the connective tissues to bring back that youthful look! Digestion – the saturated fats in coconut oil help control parasites and fungi that cause indigestion and other digestion related problems such as irritable bowel syndrome. The fat in coconut oil also aids in the absorption of vitamins, minerals, and amino acids, making you healthier all around. Nose bleeds – coconut oil can prevent nose bleeding that is caused by sensitivity to weather such as extreme heat and extreme cold. This condition happens when the nasal passages become dry because of cold or dry air resulting in burns and cracks in the mucus membranes so bleeding happens. To prevent this just put coconut oil in your nostrils. Doing this will strengthen and protect the capillaries in the nasal passages. Weight loss – saturated fats contribute to weight loss and controlling cravings. Goo Gone – just mix equal parts coconut oil and baking soda into a paste. Apply to the “sticky” area and let it sit for a minute. Then scrub off with an old toothbrush or the scrubby side of a sponge. Please share this post on your social media wall and add your favorites with #101CoconutOil #healthyfats @DrAlisonChenND.